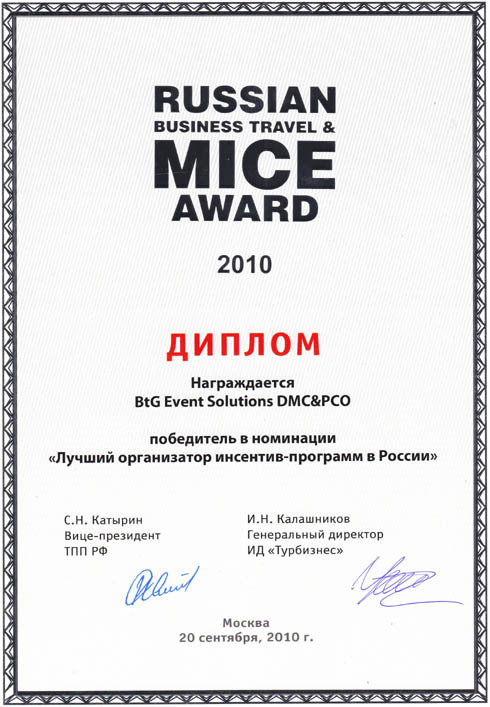 Dear partners, we would like to inform you that BtG DMC Russia has become the prize-winner in the Russian Business Travel&MICE Award 2010. This professional award in the sphere of business tourism and MICE was established in cooperation with the Chamber of Commerce and Industry of the Russian Federation and with the assistance of leading international business magazines and internet-portals. The project involved the significant players of business tourism market, 22 nominations had been announced, the competition was outstandingly rough and rigid, all participants  pure professionals and experts in MICE industry. Our company is extremely proud of obtaining the award in the nomination "The best organizer of incentive programmes in Russia 2010", we are glad to be among the most prestigious and desired MICE specialists in Russia. BtG is extremely grateful for all your co-operation, kind help, support and assistance throughout voting, we will never stop highlighting that our victory is your victory as well! It is even more pleasant to obtain this award on the day of BtG's 5th anniversary, no other present could be compared with the acknowledgement and estimation of our partners, clients and suppliers! Thank you for the cooperation, we promise to justify your trust and hang on being the best in Russia!